I was late again this morning in coming to school. I cannot put the blame to the driver or to the traffic. I was late because I get up late. I still have to feed my baby and prepare his milk so that his Nanay (my Mama) won't get stress in preparing all those things. 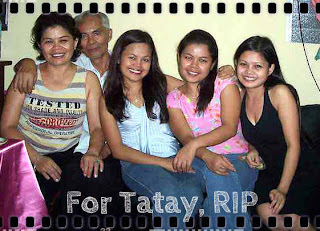 It's been six days already that the whole family stays together at my Mama's house and six days since our Tatay is gone. Tomorrow will be his scheduled burial and sad to say we cannot go there at Bukidnon to pay our last respect. The situation is quite complicated so I suggested to my Mama to have our simple way of bidding goodbye to our Tatay by releasing a white balloon tomorrow. Right after tomorrow, all of us (my Manoy and his family, my other brother's family, all our relatives and friends who will also be with us) will go back to our respective home, leaving our Mama alone in the house. Well, that's how I sees thing then. I know it will not be easy for my Mama. I've known for a fact that we can only appreciate the value of an individual when he/she is gone already. However, we tend to forget this kind of reality unless we could actually relate to it. When Tatay was still alive, he became quite irritable as his condition worsen. He constantly woke Mama up in the middle of the night. He often shout as if he was badly hurt. He's like a child who always long for attention. Mama's condition isn't really that good as well because she has a hypertension and she keeps on complaining that he barely sleeps at night because Tatay keeps on waking her up. During daytime, Tatay used to stay outside the house to keep himself from too much boredom because he has no one to talk to because Mama is busy also in doing her duty as Barangay Official in the place where we previously resided. Tatay is an extrovert type of person. He always wanted to have someone to talk to. Thus, despite his worsen condition, Tatay made an extra effort with the help of his assistant, whom Mama hired, to go to a neighbor's house few meters away from ours to talk with his so called "best friend" who is older than him yet still in good health condition. Tatay's daily routine goes on that way. Looking back all these things, I know Mama will miss him. She will miss those good and bad times that they've shared together. Tatay used to cook for her when he was still in good health, sing for her whenever we are all gathered for a celebration. I remember how Tatay insisted to have a Lechon Baboy (grilled pork) on my 27th birthday by giving up Sabadik, his alagang baboy.He actually did the same thing when I passed the Teacher's Board Exam. Way back in College, I could easily approach Tatay for permission than Mama. He was actually my lawyer because he has the final say and Mama couldn't do anything about it. I am a hard-headed individual who always insist on the things that I want and Tatay knew about it and he understood. Indeed, he completely perform the role of a father into our life. There are five of us in the family and during our Big Day, he was always there. He was the one who walked us down through the aisle except for my little sis (Tatay's girl) who got married at the US. This is the thing that my biological father never ever witnessed because we did not allow him to. Until now, the idea of losing Tatay for good hurts. The man who was selfless enough to accept us as his own. If not for him, I may not able to finish my studies 10 years ago and all those selfless acts that he did for all of us in the family. Well, I am not saying good bye because I know that sooner or later, I will also have my final rest. Tatay , thanks for your selfless love. We will miss you! I can tell that your Tatay sis is indeed one selfless person. He will forever be remembered and cherished, for sure! My condolences...it's never easy to lose someone we love dearly. Like just Marie Tillman said, "The sadness will run its course," but it's never going to go away." But I know, in time, you'll be able to move on. bpc hop.